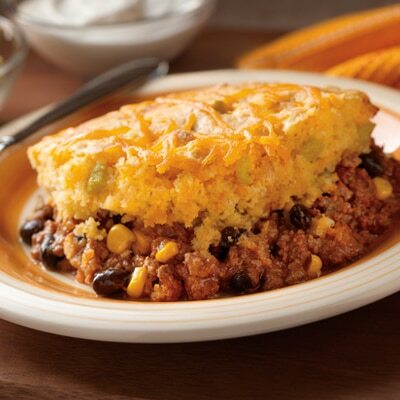 This Chili vs. Cornbread Bake is a unique two-in-one dish that is perfect for group entertaining and would be perfect for fans watching games! Tender golden cornbread with jalapeños blended in meets a Mexican-inspired chili. This is a fun new way to enjoy two favorite recipes in one dish. PREHEAT oven to 400° F. Grease 13 x 9-inch baking dish. COOK beef in large skillet over medium-high heat until no longer pink; drain. Stir in chili seasoning, tomato sauce, corn, beans and 3/4 cup evaporated milk. Bring to a boil, reduce heat. Simmer for 5 minutes, stirring occasionally. Pour mixture into prepared baking dish. COMBINE corn muffin mix, remaining evaporated milk, eggs, chilies and 1 cup shredded cheese in medium bowl; stir until just moistened. Spread mixture over meat filling. Sprinkle with remaining 1/2 cup cheese. BAKE for 15 to 20 minutes or until lightly browned. Let stand for 10 minutes before serving. Serving suggestion: Serve along with chopped avocado, sour cream and salsa.